If you have any doubts that digital transformation is top of mind for IT executives, just take a look at what they're buying. Spending on enterprise software, particularly cloud services and applications, is expected to grow faster than any other category of IT this year, fueling an overall increase in global spending on technology. That's according to a report from market research and consultancy firm Gartner, released today, that forecasts a 3.2 percent rise to $3.77 trillion in worldwide spending on IT. Spending on enterprise software is forecast to jump 8.5 percent this year from 2018, to hit $431 billion. Included in the enterprise software category are ERP (enterprise resource planning), SCM (supply chain management) CRM (customer relationship management), open-source, on-premises and cloud software. Within the overall enterprise software category, cloud computing infrastructure and applications will absorb most of the spending, totaling $214 billion this year, up 17.5 percent from 2018, Gartner said. "The most important thing we’re seeing is the shift from bricks and mortar business to digital business," said Gartner analyst John Lovelock. "It's the main driver of the uptick in spending." Though cost optimization is important, it's not the main reason for moving to cloud services and applications, Lovelock said. "The fact that were going to cloud is more about agility, getting the feature functionality you need at the speed you need it. Digital business runs at a much faster speed than [bricks and mortar] business; hyperscale data centers are the only things that can support the speed of digital business, the cooperation required in digital business -- it's very difficult to do that on-premises." The rise in cloud spending, though, is not globally uniform. "It must be said that on a global basis cloud is really an infection started in the United States, and is spreading; the U.S. is almost 60 percent of the current cloud spending around the world," Lovelock said. Among other things, the lack of hyperscale data centers in developing markets contributes to application latency that slows cloud growth in those areas, he said. Spending on IT services and data-centers systems will also contribute significantly to overall growth. Spending on data-center systems including servers, storage and networking technology will rise 4.2 percent to $210 billion, while spending on IT services will increase 4.7 percent to $1.03 trillion, Gartner says. Though spending on devices and communications services will also increase, they are lagging behind the other categories, Gartner says. Spending on communications including fixed and mobile telecom services as well as unified communications technology will grow 1.3 percent to $1.4 trillion this year. Meanwhile, spending on devices including PC, tablets, mobile phones and printers is expected to increase 1.6 percent to $679 billion. The new features offered in phones coming out on the market don't appear to be providing enough impetus for many users to upgrade, especially in a time of economic uncertainty, Lovelock said. "We're looking for the signs of economic dislocation right now," Lovelock said. Clouds on the economic horizon include the imminent exit of the U.K. from the E.U., trade tensions between the U.S. and China and the possibility of rising tariffs worldwide, which all inject uncertainty into business plans. "It's tough for a London bank to make plans to spend big on technology when it doesn't know what its business model is going to be post-Brexit," Lovelock said. Macro-economic issues are a big concern for business executives. 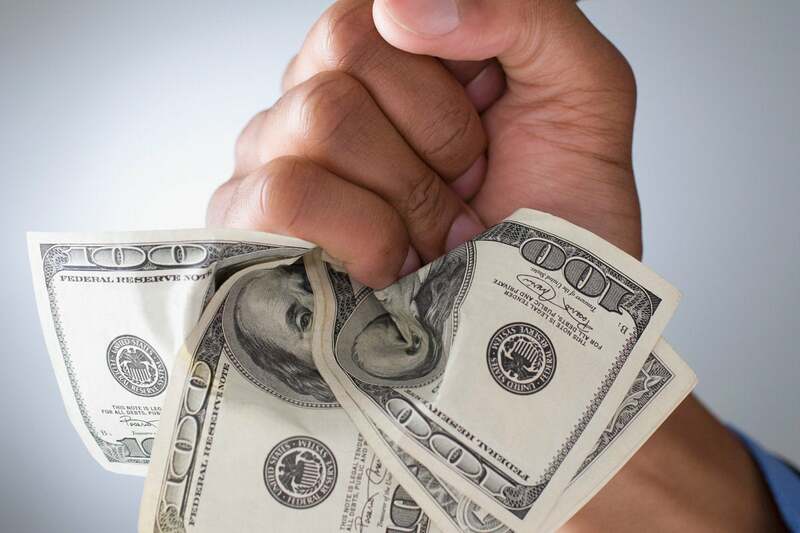 Lovelock noted that the most recent CFO poll taken by Duke University shows that 46 percent of respondents believe a recession will occur in 2019. 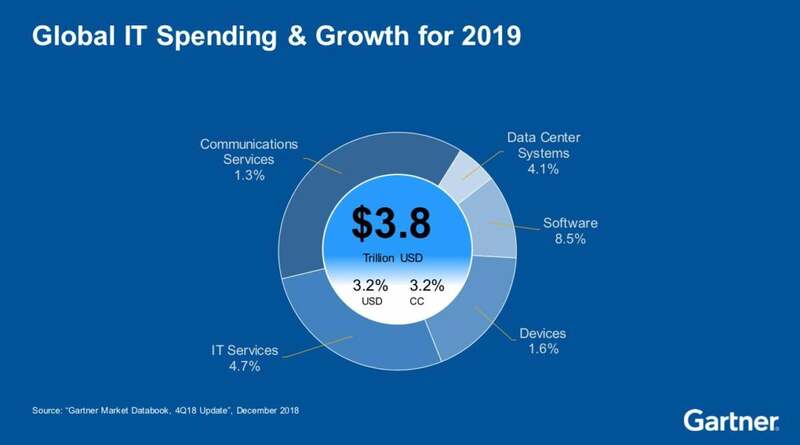 Nevertheless, Gartner's 3.2 percent IT spending growth forecast for 2019, while somewhat lower than the 3.9 percent growth experienced in 2018, remains fairly strong. "There are things happening at the fundamental level about why people are buying IT and what they plan to do with it that’s changed dramatically — the way we make money is changing," Lovelock said. In other words, despite geopolitical issues weighing on the minds of business leaders, the basic driver for tech spending — digital transformation — is here to stay as a driving force for IT. This story, "Gartner: Cloud, enterprise software to drive global IT spending increase" was originally published by CIO.